The day after halloween always seems to be a little bit of a let down for the hatchlings, and this particular 1st of November, all their activities went wrong as well. When we finally came home after a long morning of things going wrong, we needed a dinner that felt something special and this was even better than that. I glazed 12 cox apples, peeled and chopped, in calvados and brown sugar. I poured the apples into an oven dish and sprinkled with a generous quantity of cinnamon. Then I topped the apples with some homemade muscavado rum caramel. 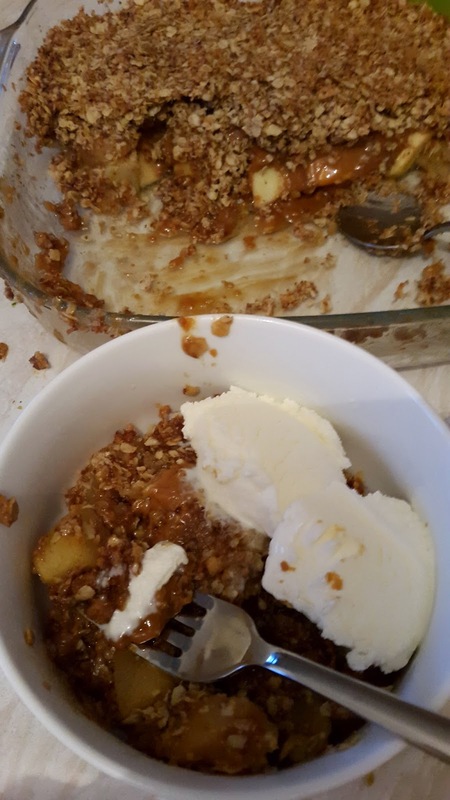 Then I crushed 8 digestive biscuits and added 3/4 cup rolled oats, and 1/2 cup dried coconut; to this I added 1/4 cup of melted butter, mixed it in and poured it over the caramel. I put it all in the oven for 30 minutes while our ice cream maker chilled my bourbon vanilla custard into ice cream. Needless to say, we all felt a lot better afterwards.